I had Wednesday off so HB suggested I head over to the market for Green Market Wednesday and the afternoon’s scheduled rain barrel workshop. So I did. The first part of the workshop presented a lecture on rain gardens. Rain gardens are planned depressions in the ground that allow storm water to runoff and collect and slowly infiltrate into the ground. 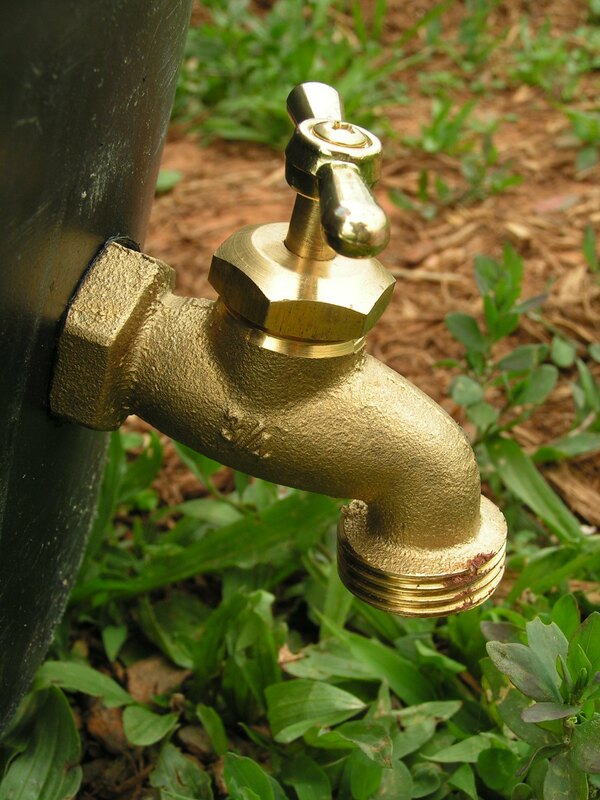 When used properly, they can lessen the amount of polluted runoff water reaching streams and rivers by 30%. Runoff water comes from parking lots, rooftops, driveways, sidewalks, roads, and other broad expanses. Problems arise when large quantities of water, often carrying pollutants from pesticides, fertilizers, sediment, debris and other wastes are dumped into streams and rivers. I’ve become more aware of the local water situations living on a farm for a few years now with spring-fed creeks running through the hills. Somethings cannot be controlled – our neighbors have a lease on the property fronting the road and we have no say in the choices of fertilizers and pesticides they use on land we do not own. But we can attempt to make the correct choices on our own property. And we may not be able to control the choices of our in-laws, but I can play a role in the choices HB and I make. Anyway, back to the workshop. Once the lecture was over, a gal from the local soil and water conservation group gave a quick talk and then we delved into making our rain barrels. Literally, delved. The barrels we were given were old pickle barrels, some (like mine) still containing old pickle juice. For a person who does not like pickles, it was slightly disgusting. For any normal person it was probably a little gross. You tip the barrel to about a 45* angle, then bend over, shove your top half inside the barrel and find your bearings inside the dark and stinky abyss inside. Lovely. 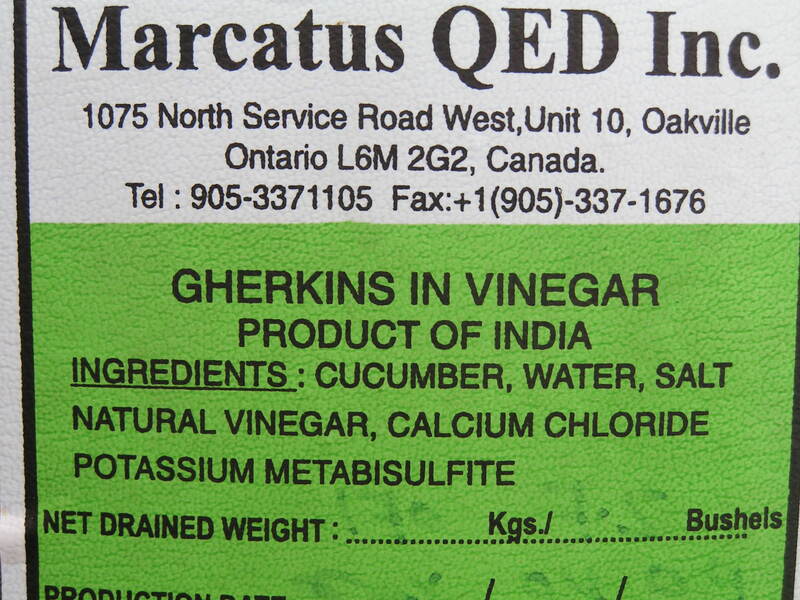 The barrels come by way of a North Carolina pickle company; of course, the cucumbers weren’t American. I’m sure the barrel isn’t made in American either. Ugh. This reminds me of the Mike Rowe (of Dirty Jobs fame) article I read this morning on the future of farming. 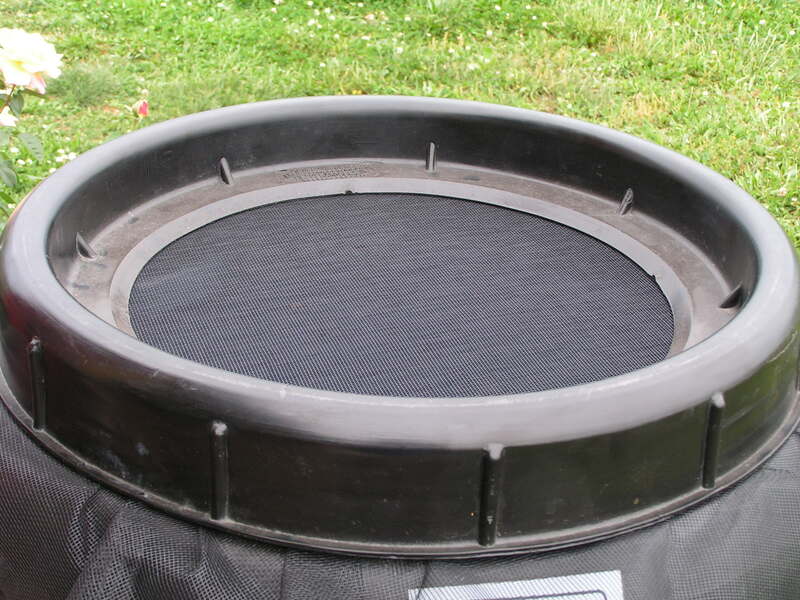 The barrels come with a permanent top that fits under the rim (similar to a canning jar), but for the sake of the barrel we remove the lid and fit a screen under the rim to keep out debris. 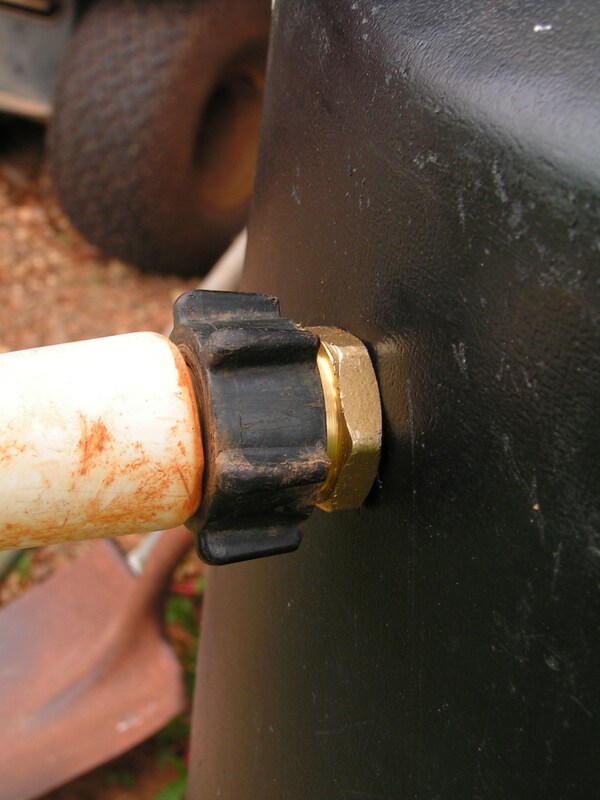 Pictured below is the overpour spout with attached hose. When the rain barrel fills, water will flow out of this hose and (for now) onto the ground. The real plan is to have multiple barrels so that when one fills up, the water travels into the next barrel via the hose. Cool, huh? And of course, we needed a spigot at the bottom of the barrel. I want to build a small platform to raise this barrel just high enough to fit a bucket and/or watering can underneath for easy filling. 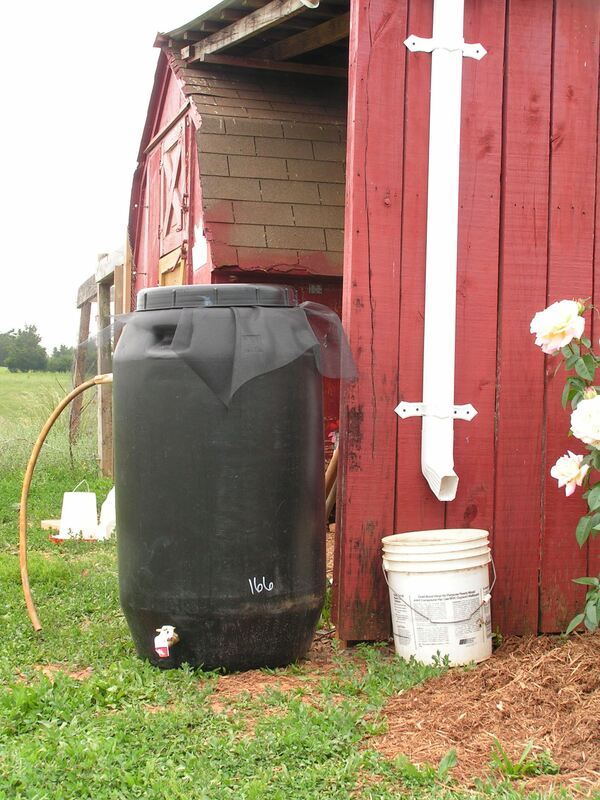 Interested in attending a rain barrel workshop at the Lynchburg Market? The next workshop will be held on June 12th from 11am to 1pm. You can get more information from the market website. Created just in time for an afternoon thunderstorm. Perfect! Wow, there is so much to say with the latest events over the past few weeks since the last post. Forgive me, dear readers (hello? anyone? ), but let me indulge you in the latest from Spring Mill. Two weeks ago, on a Sunday morning, we processed our old laying hens. I debated about if it was something I wanted to share with the blog, but have decided there is nothing to be ashamed about. We received these hens as day-old chicks, raised them with love and care, and in return they (unknowingly) provided us with eggs for nourishment. I sold their eggs to my co-workers last year, so they provided nourishment not just to HB and I, our in-laws, but also to at least 50 other people when you count the eggs eaten by our neighbors, co-workers, friends and their respective families. Amazing the impact of 11 little hens, isn’t it? 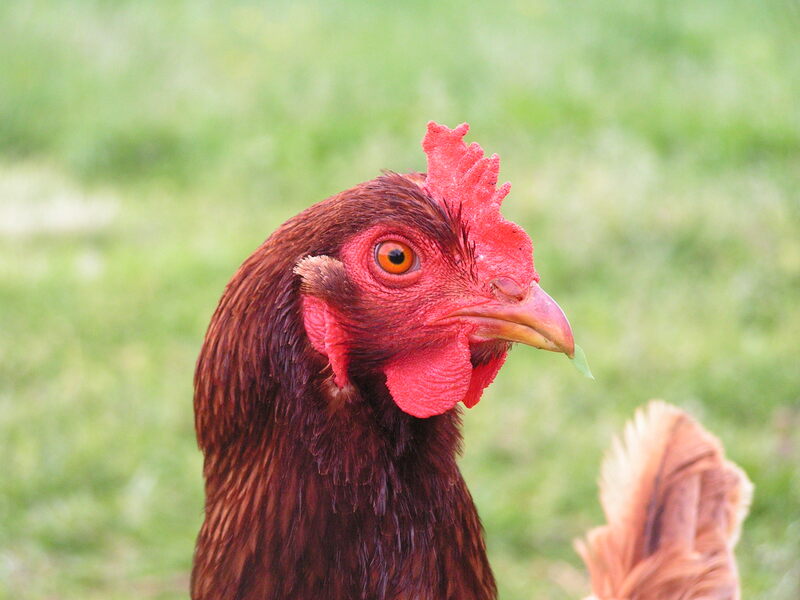 The hens were getting older, laying less, and eating what eggs they did lay – a habit we tried hard to break, but never could. So we set up one Sunday morning, and processed the hens. The first one was the hardest for me, and after that it became a respectful thanksgiving as we did each hen. The processing wasn’t that difficult and it was actually pretty interesting. In their death, these birds will continue to provide nourishment, and that’s another amazing aspect. Last week Xenia kidded a beautiful little doeling, who we named “Bette Davis” to keep up the year’s theme. She is a sweet, spunky little girl. Despite wanting to bottle-raise, we’ve decided to let Xenia raise her. Our work schedules just don’t allow time for midday feedings. Now I’m trying to decide when to introduce her to the rest of the herd. Bette is so much younger than the other kids, I don’t want them to bully or injure her with their roughhousing! The goat barn is coming along well. 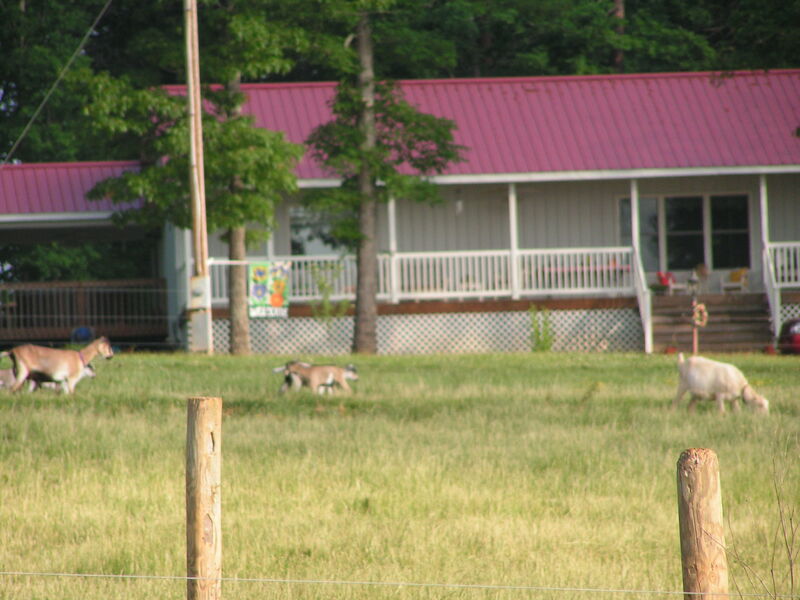 We’ve fenced in the small barn lot surrounding it and putt up two of the three gates. We’ve started some of the interior wall work, and once that is finished will complete the outer front wall. Then! we will be able to move the goats out there. How strange it will be to not wake up to them “baaaaa”ing out my back door! Our rose bushes are in full bloom and I’m in love with them. Every year they get better and better. These were $6 tea rose hybrids we picked up on a whim at WalMart a few years back. 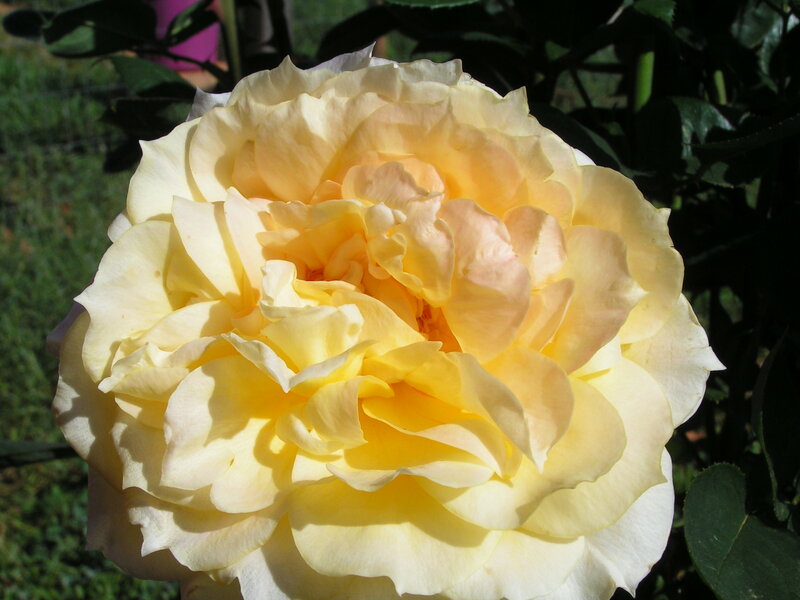 I love the blooms – one blooms a buttery yellow, the other blooms a pale yellow with pink-tinged petals. Walking out to the chicken coop and seeing these lovely plants makes me smile. 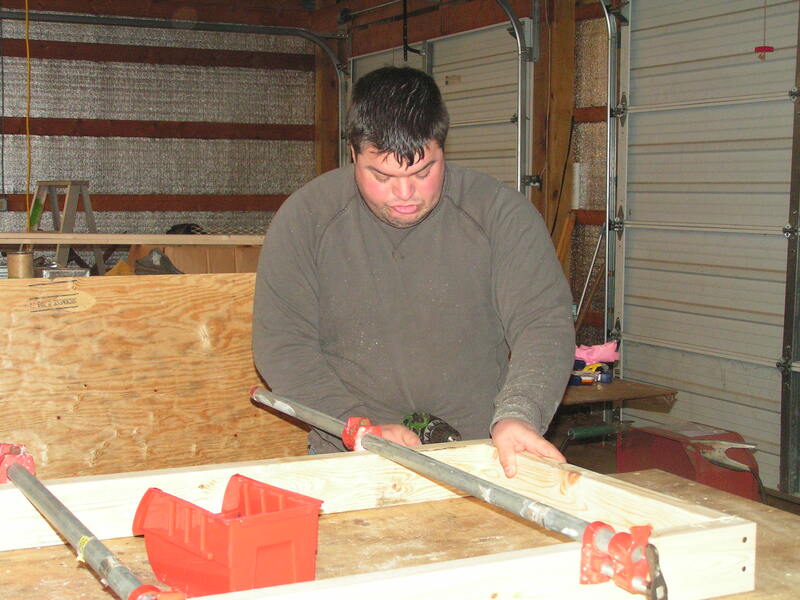 For the past several weeks we’ve been working on the goat shed whenever we get a chance. I’ll be honest: HB has put in the most work, then my father in law, then me. 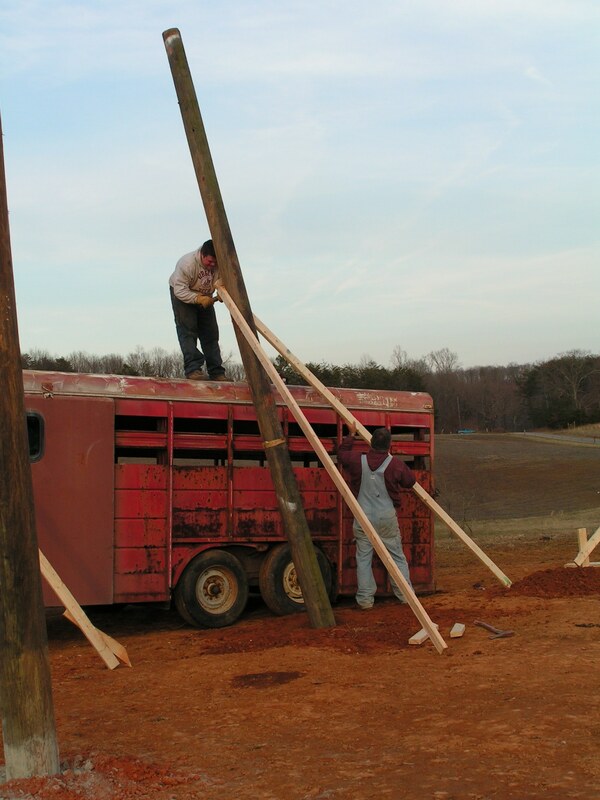 Partially because I’m a chicken about standing on top of that horse trailer to help, partially because I’m a weakling and those rough cut oak 2×8’s are heavy, not to mention the weight of those old telephone poles. You can really get a sense of the shed now. The entire shed is 36 feet long, 12 feet wide. On the far right end, there will be a hay loft and storage area. Underneath the hay loft and furthest to the right will be a storage area, 8 feet long. We plan to line this area with shelves and have storage area for medications, minerals, feed, and perhaps a bale of hay or two. Next to the storage space will be the milking stall, 6 feet long. 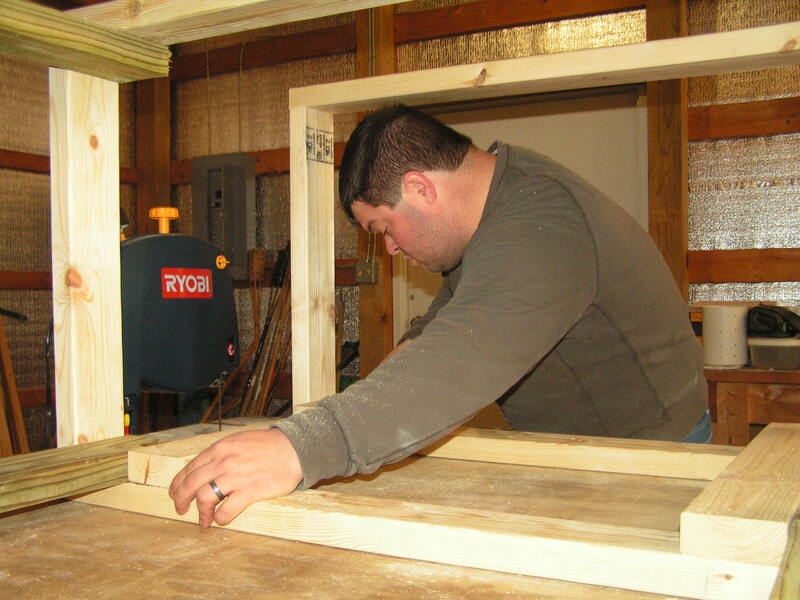 Then there will be two parallel stalls, 10 feet long, 6 feet wide. These will be perpendicular to the milking area. The plan is to have these stalls available for use as shelter, holding pens for milking, kidding, or what have you. 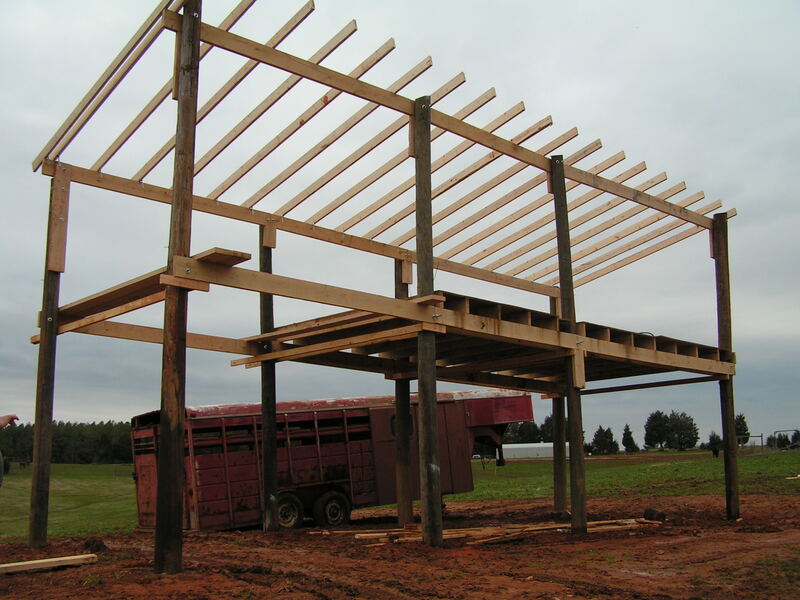 The last 12×12 foot space will be open as a loafing area for goats to rest and be protected from the wind. Eventually we will probably add on to this shed, with larger overhangs to extend the loafing area and quite possibly an additional shed that faces the tall side to extend barn/storage space if we find it necessary. When we visited my family for Christmas, there was a very large box with our names on it. We quizzed each other about what it could be. Imagine our surprise when we opened it and found the most thoughtful gift! 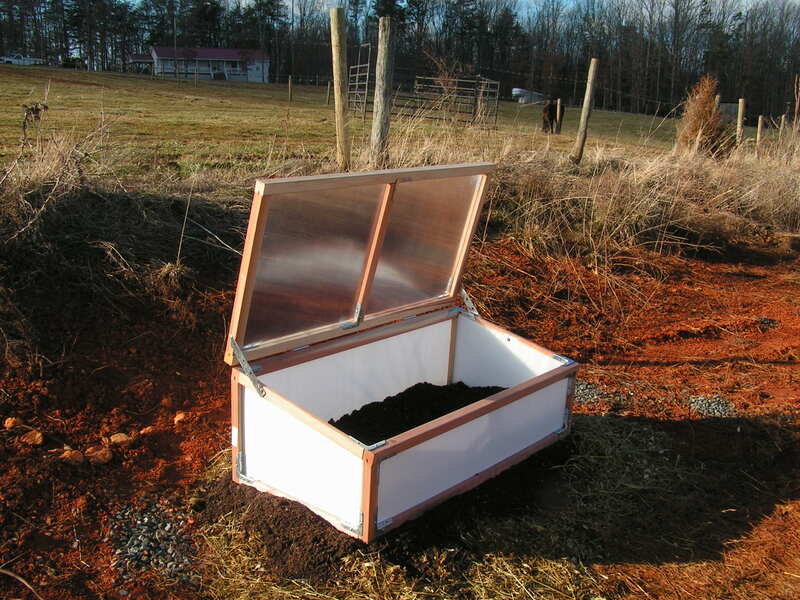 A cold frame! And then the snow came. And it really overstayed its welcome. But we finally seem to be on the mend, and last weekend I sat down with my drill and the directions and put the cold frame together. I let it sit for a week to warm up. It’s definitely warm inside! The frame itself is pretty light, so we’re brainstorming anchors for it. The wind blew it over on Friday. But it’s tidy and sits upon a pile of horse manure (thanks, Huck!) and potting soil. I plan to sow a few seeds this week – perhaps some spinach? and carrots? I need to dig through my seed packets and see what’s available! So Mom, Dad, if you’re reading this – thank you! By the way, that hillside surrounding the cold frame is an erosion masterpiece. I’m currently supplementing it with Huck’s manure with hope that overtime we can slowly mend it. Every year I plant every weed imaginable – mint, sunchokes, etc. in hopes that it will conquer the clay hillside. Monday of this week was absolutely gorgeous. Highs in the low 50’s, the sun shining brightly. Despite the fact that I screwed up and went into work on my day off (and subsequently spent half my day off working as a receptionist to earn a little extra money), the animals and I took advantage of the weather. 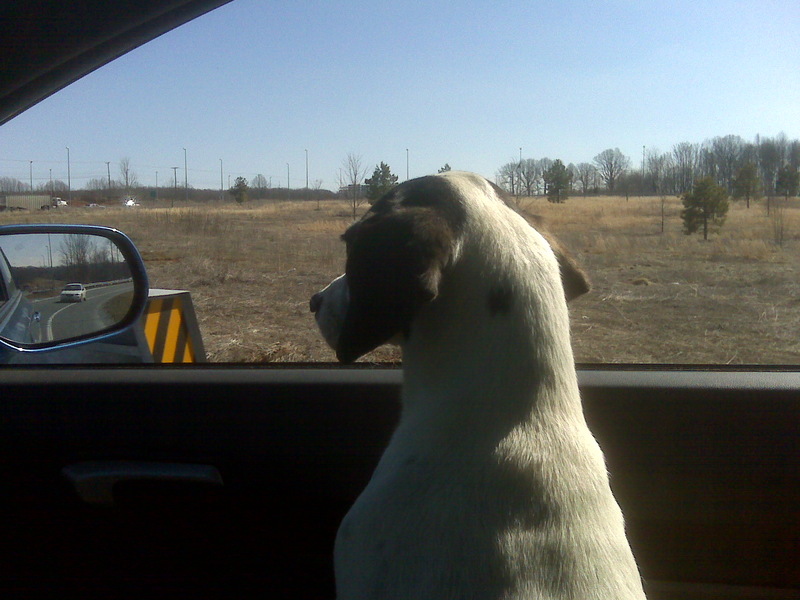 On our way home, I rolled down the windows so Chester could stick his head out and enjoy the breeze. Once home, I was greeted by my darling herd of dairy goats with their queen, Jacqsonne, at the lead. 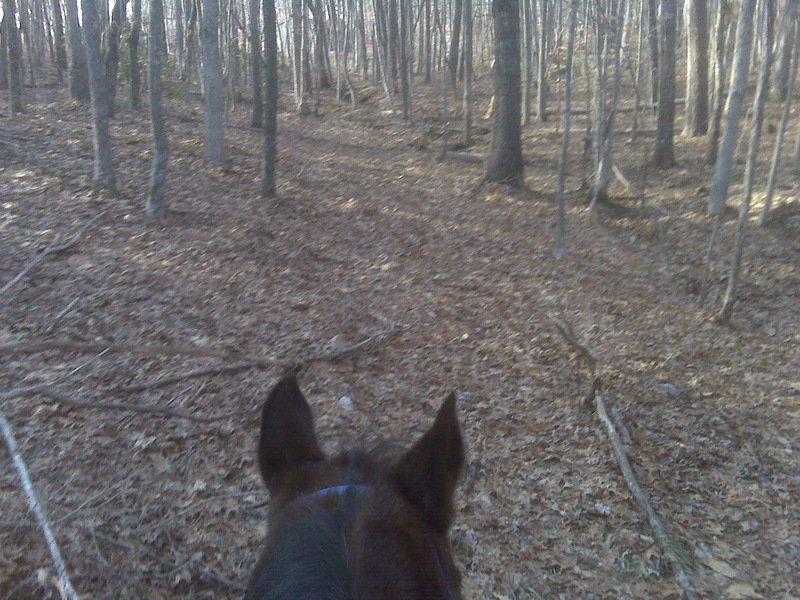 I myself took advantage of the afternoon by taking Huck out for a ride in the woods. 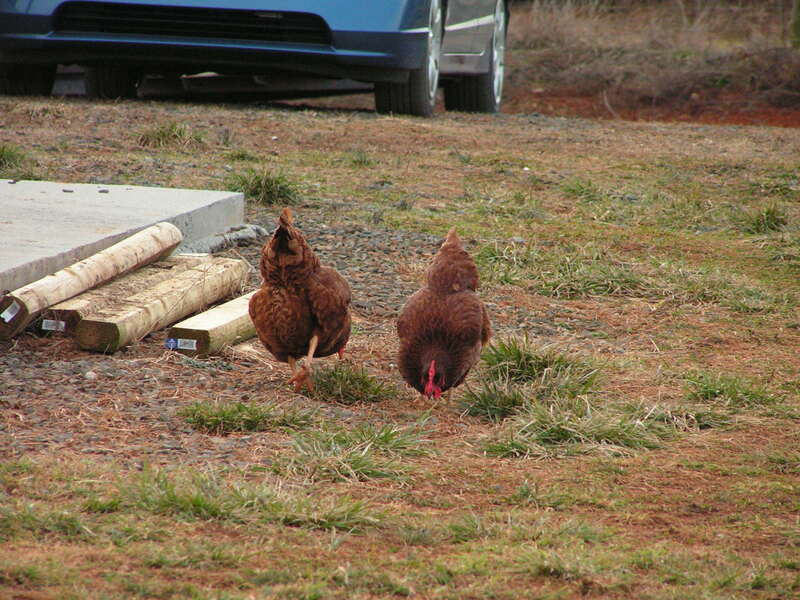 The hens rejoiced in the warm weather and scattered across the barnyard. HB and his dad spent the afternoon finishing the placement of posts for our goat shed. And yes, this is a lesson in farm UNsafety. 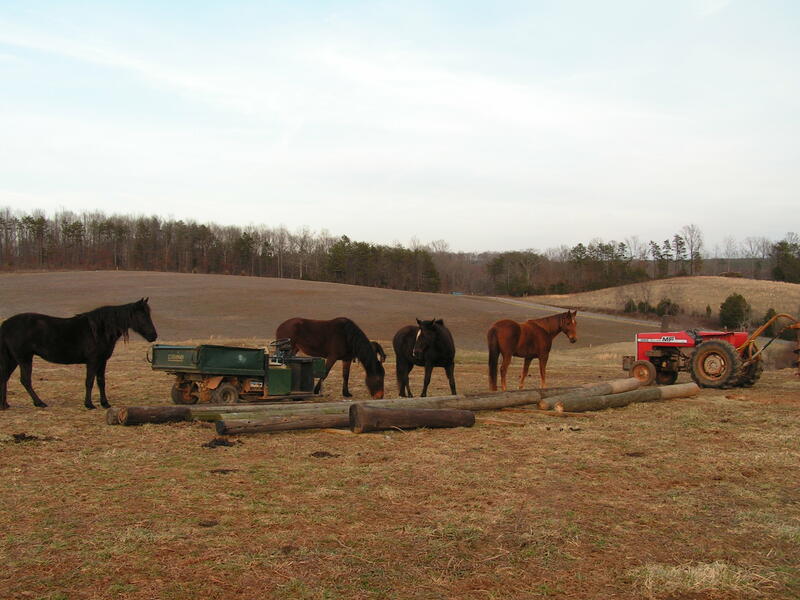 While the horses in the front field supervised the building and equipment. Haven’t been on the farm much this weekend – I got the opportunity to take my horse down to vet in NC to have him check for ulcers on the cheap ($70 sedation cost for a $500+ procedure) and before I knew it, he was loaded on the trailer and we were on the road. We confirmed my suspicions that he has developed gastric ulcers and so I will be doing a lot of reading on management to prevent their development! In the meantime, I’m saving up for the treatment which a course of ulcer medication for about a month. We also confirmed with a second vet that he does in face have 2nd degree AV block – basically his heart regularly drops a beat. It’s common in athletic horses, and typically goes away once the heart is at a working heart rate. I’m re-evaluating my stethoscope which is crummy, but I hadn’t heard this. Or maybe last year he was already fit and it wasn’t an issue like it is now, 6 months into an 8-month rehab with a lot of stall rest? Either way, Huck has provided some new interesting developments. You can follow the developments more at Huck’s blog. The farm is running on auto-pilot and Jacqsonne continues to do well. All the goats are doing well. Hard to believe we’re just a few weeks out from kidding! HB picked up old telephone poles to use as the base supports for the new goat shed. Saturday afternoon a friend came over with his backhoe to level a spot for the shed. HB’s picking up concrete as we speak and the plans are to get the base supports up today! Build It! Hay Manger for Goats! For Christmas we made the boys a hay manger. We liked the design of it so much that the first thing we did when we brought the girls home was go directly to the lumber store and buy supplies to make a second one! The girls gather around their manger on a snowy day. Now that we’ve been to several goat farms, I really like our hay manger design the best of what we’ve seen. 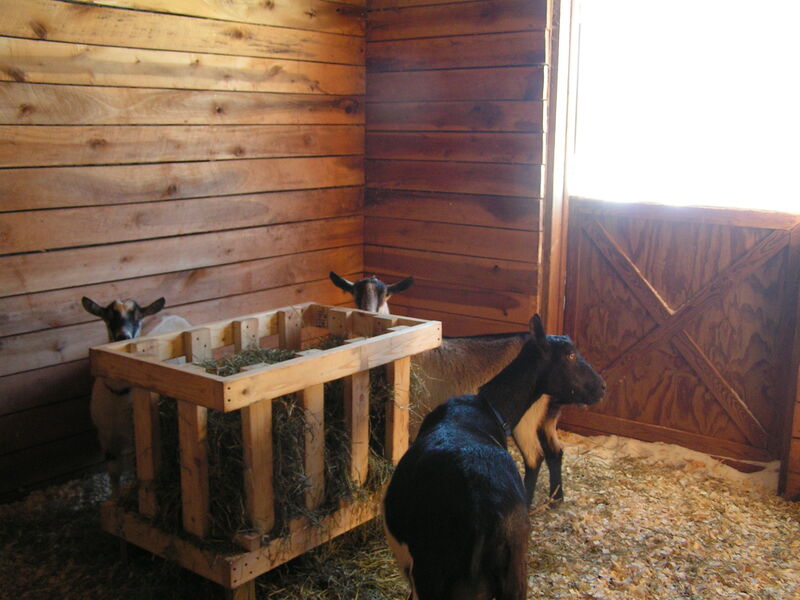 We set the manger in the middle of our stalls which allows the goats to space around them and eat. Of course, our mangers are small – only holding about a full bale of hay (less of the alfalfa/orchard grass bales) – and we only have a few goats eating out of each manger. Eventually we’ll have to modify the design or just build more of these mangers and space them out. I thought I’d walk you through the basics of our hay manger. First, after a lot of debate, we went with the plan from Goat World with a few modifications. We liked this plan for several reasons. One, it was fairly inexpensive – I think we spent about $30 on each manger. We liked the airiness of the design – no solid floor, plenty of room for ventilation and letting small pieces fall aside. 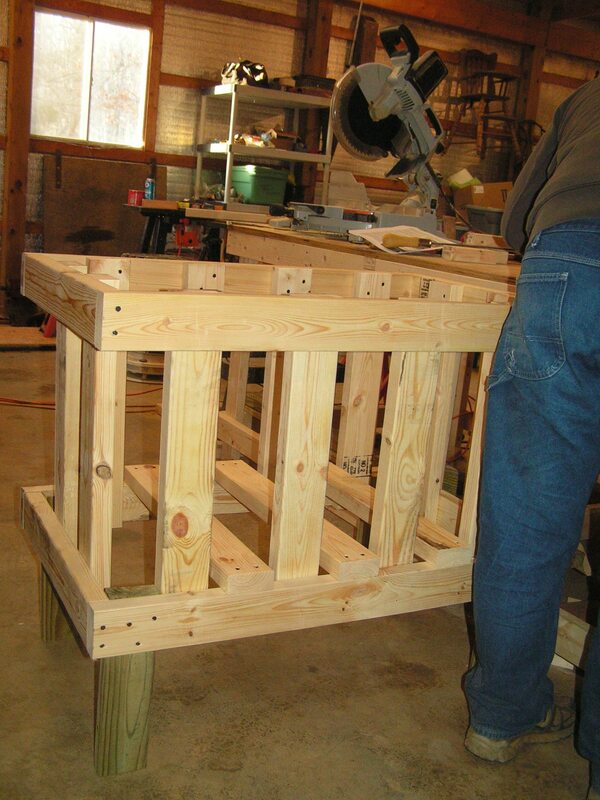 It allows for easy eating from the side and the top, with plenty of room for our goats to stand around it. 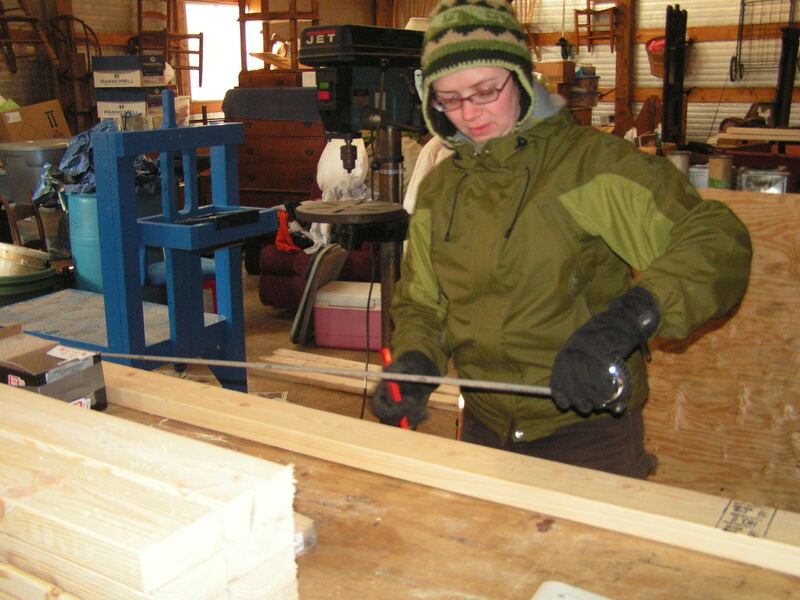 First, measure and mark your lumber. I recommend trying not to make these mangers on the coldest day of the year like we did. I was all bundled up while working in the garage with the kerosene heater burning! 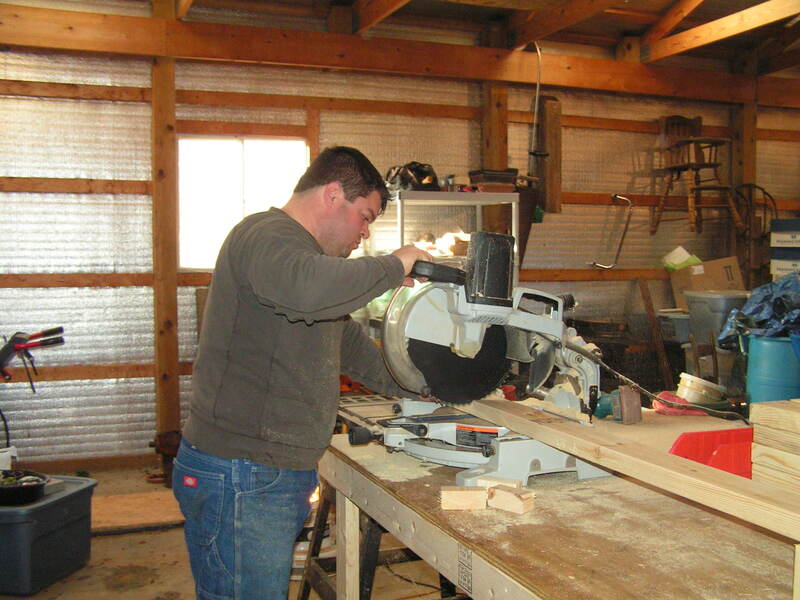 Next, carefully cut the lumber at the designated spots. Obviously, HB is more accustomed to the cold than I. Then, it's time to make the base. Because HB has a variety of wood-working tools, we use these handy clamps to hold our wood base “square” (although, it’s really a rectangle). The GoatWorld article mentions a different way to ensure you maintain 90* angles. 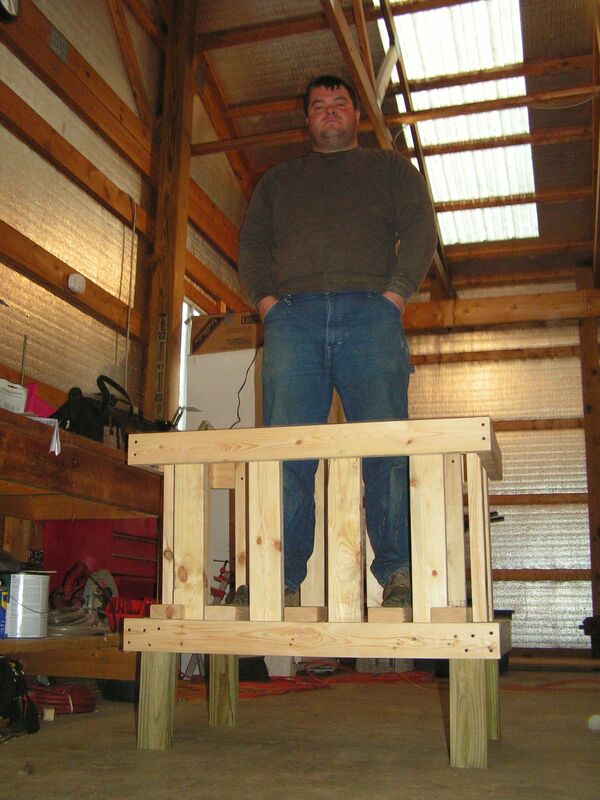 This is one place we modified our design and used treated lumber for the legs since they will be in contact with urine, manure, soil, and who knows what. 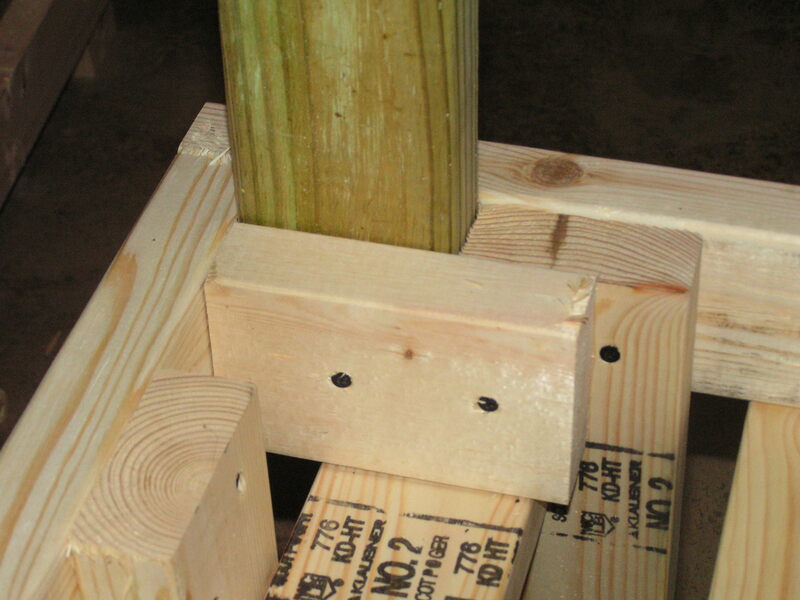 Once again, we like to use clamps to hold the wood in place while we tighten screws. And now you start inserting the slats to hold it together. This is when it starts to count – how square are those bases? Luckily you’re able to adjust it some by working the slats just right. 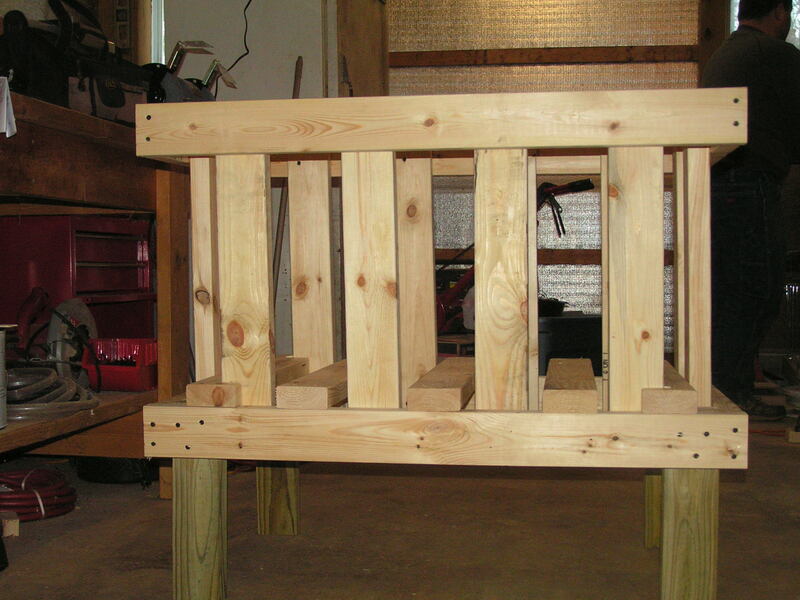 Slats go down the sides and across the bottom. Now, technically, you’re done. Congratulations! But we found one little problem, and easily remedied it. So let’s continue, shall we? And we have just the fix for you! 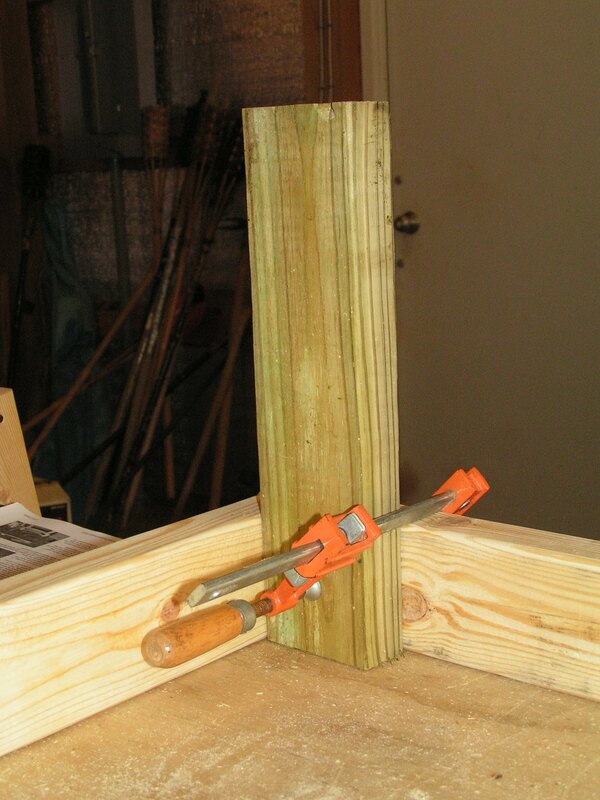 First, DO NOT cut this piece of lumber when you do your regular cutting at the start of the project. Why? Because you want to make sure it fits the dimensions of the finished product. 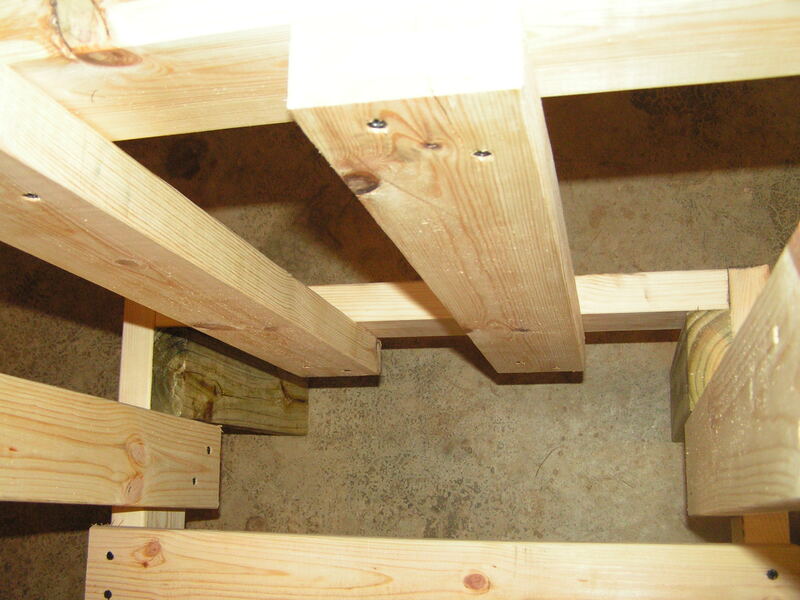 If your rectangular bases are out of alignment (ie: not square with tidy 90* angles), you might need these pieces to be longer or shorter, depending on how the manger comes together. After measuring the space we cut the lumber. 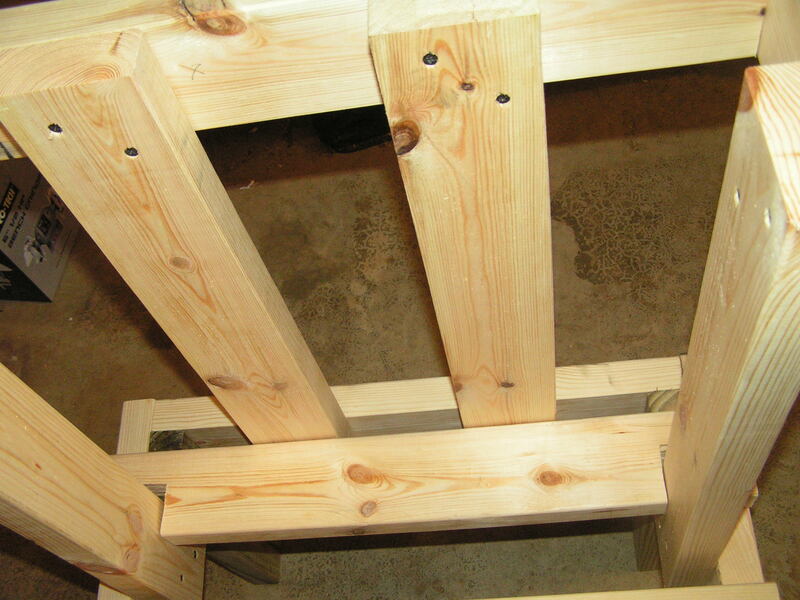 Then, to make a tidy fit, we cut little squares out of each end, so that it fits nicely alongside the upright slats. Add a little more support, just in case. Because of the addition of these extra end pieces, and having to cut out part of the wood to make a clean fit, we added additional support underneath. And now, congratulations! if you stuck it out this far! You are officially done. Unless you plan to put this outside and want to add a roof. Which, eventually, I want to design how we will do that. But for now, we use these in shelters that already have a roof. Isn’t it handy? Did I mention it was sturdy? Oh, and did I mention how strong and sturdy they are? 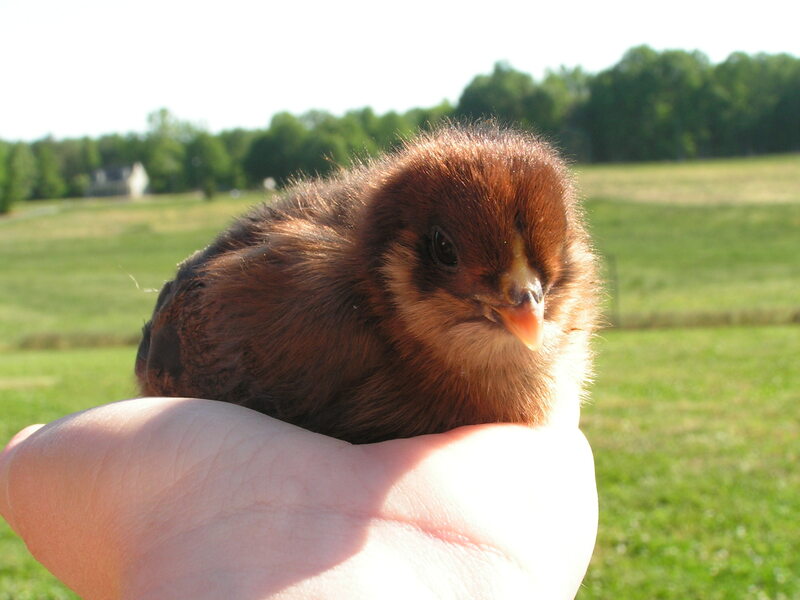 30 chirpy chicks, 11 happy horses, 11 inquisitive goats, 2 loving dogs, 2 independent cats, a large garden, and a small vineyard in South Central Virginia. We love our farm, our animals, making wine and cheese, and our local farmer's market. Follow our story here. Our kidding season is finished! 1/10/10 - Jacqsonne aborted 5 kids. We were very saddened by this event, but feel very lucky to have her safe and healthy with us. 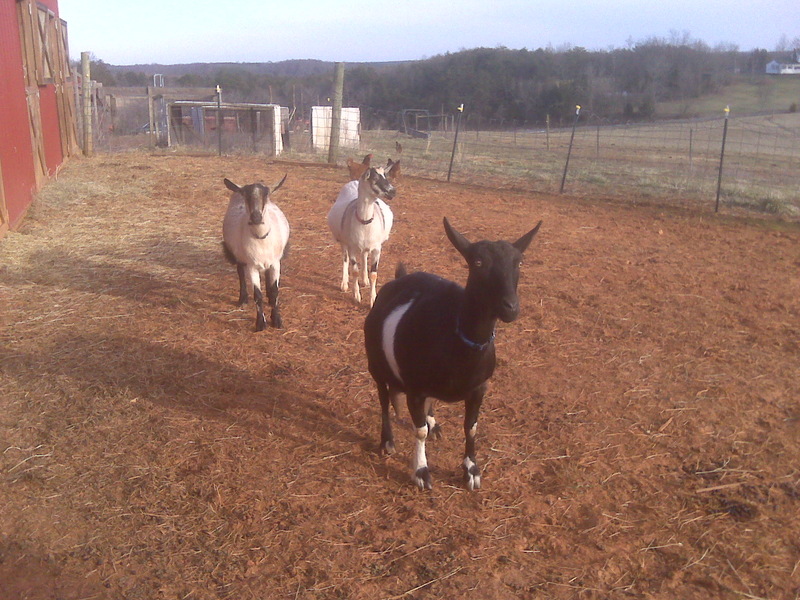 3/22/10 - Abba kidded twins, a doeling named "Doris Day" and a buckling named "Rock Hudson." 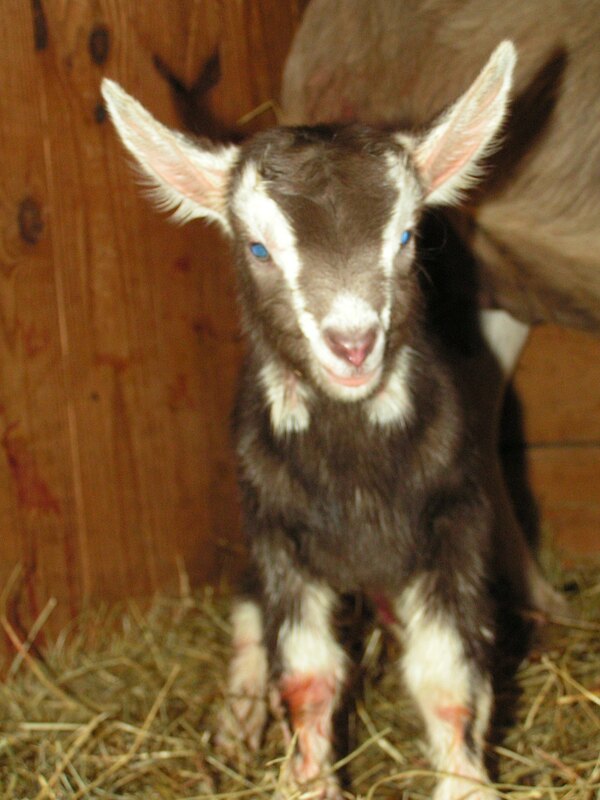 3/25/10 - Memphis kidded twin bucks, "Fred Astaire" and "Humphrey Bogart"
5/5/10 - Xenia kidded a single doeling, "Bette Davis"
Enter your email address to subscribe, and you will receive the latest updates from Spring Mill Farm via email!